So I was watching television the other day. Local television, since in my house, we do not subscribe to satellite or cable. My husband and I were bickering over commercials. He hates them, I like to see what Corporations are pushing on the American Consuming Public. He walked out of the room to avoid the commercial and I was fortunate enough to catch this! First I went to the website and browsed around. Then I went to the bottom of the site, perused the links to information and finally clicked on “About Michelle Rhee” under “Mission Statement“. 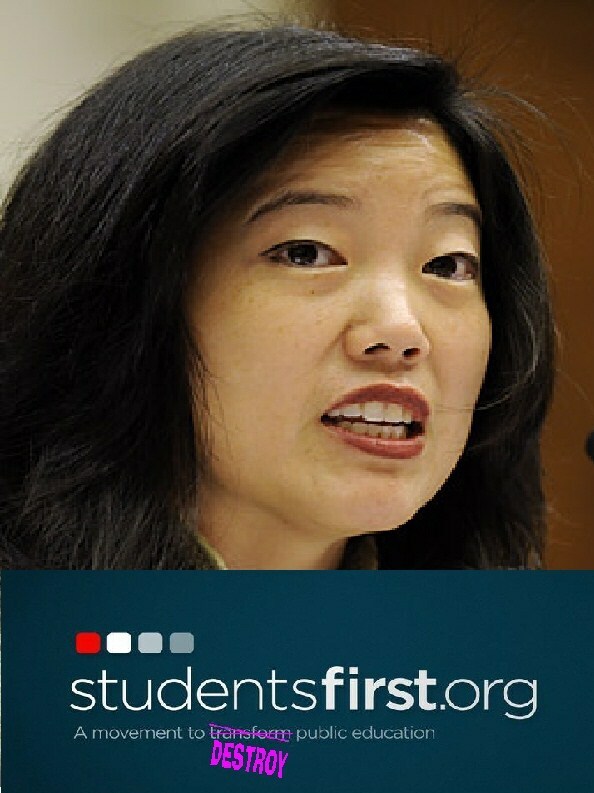 She is the creator of StudentsFirst.Org. Her resume is quite impressive, at first glance. After that, because I was still being misled, unbeknownst to me as yet (you can’t know what you don’t know), I typed her name into google to see what would come up. There’s more however, I think that’s a good place to start. This woman is evil incarnate as far as education is concerned. She has partnered with every Governor that has a “Scott” in their name as well as Governor Sandoval of Nevada, Governor Haslam of Tennessee and by extension, the Koch brothers. Their mission is to dismantle all Unions, starting with education and working their way through the rest of each and every state across America, thereby reducing those of us who still have jobs, to slave wages. To make us their beggars. Do not support this site and make everyone you know aware of what they really stand for. If you run across a really well done commercial, billboard, even an email promotion, investigate it before you commit to it. I’m glad I did because now I can share this information with you.